Bram van Sambeek, bassoon, (1980) was the first bassoonist ever to receive the highest Dutch Cultural Award in 30 years: The Dutch Music Prize, handed out to him personally by Minister of Culture Ronald Plasterk in 2009. On this occasion Bram played the bassoon concerto by Gubaidulina with the Rotterdam Philharmonic and chief conductor Seguin. De Telegraaf newspaper wrote of this performance: “He uses his instrument freely as a mouthpiece, conjures the finest timbres, and is technically capable of doing anything”. In 2011 he won a Borletti Buitoni Trust Award, and recently he has been admitted to The Chamber Music Society Two programme of New York’s Lincoln Center. From 2002 until 2011 Bram was Principal Bassoonist of the Rotterdam Philharmonic Orchestra; since 2009 he has been teaching the bassoon at the Codarts Conservatory in Rotterdam. He plays regularly as a Guest Principal with, among others, the London Symphony Orchestra and the Mahler Chamber Orchestra. Focussing mainly on chamber music, Bram is a member of the Orlando Quintet, and made his Amsterdam Concertgebouw debut in 2003. As a chamber musician he has worked with Alexei Ogrintchouk, Julius Drake, Inon Barnatan, Liza Ferschtman, Cecilia Bernardini, Reto Bieri, and performed with the Netherlands Wind Ensemble, the Asko Ensemble and the Scharoun Ensemble. In 2010 Bram was offered a Carte Blanche series of concerts in the Concertgebouw Amsterdam to perform several recitals with a number of ensembles, including the Prazak Quartet and the Tempera Quartet. He is a regular guest at festivals like the Delft Chamber Music Festival, Orlando Festival, West Cork Chamber Music Festival and the Oxford Chamber Music Festival, and has investigated concert practice in cooperation with Radio Kootwijk Live, experimenting with innovations such as playing people to sleep. Bram van Sambeek performs regularly as a soloist with orchestras such as the Rotterdam Philharmonic Orchestra, Sinfonia Rotterdam and Georgian Sinfonietta. Recently he played concertos by Villa Lobos, Mozart and Gubaidulina. 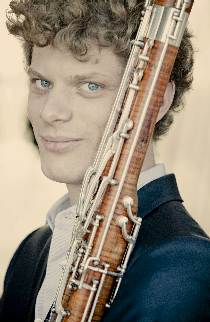 Bram decided to start playing the bassoon when he was ten years old, beginning his studies with Fred Gaasterland and continuing later with Joep Terwey and Johan Steinmann at the Royal Conservatory in The Hague. After his graduation, he took private lessons with Gustavo Núñez. In addition he has participated in master classes with Brian Pollard and two of the few real bassoon soloists in the world: Klaus Thunemann and Sergio Azzolini. Van Sambeek also plays a very special bassoon, an instrument that used to belong to both of these men. On his debut CD with Brilliant Classics, called “Bassoon Concertos”, he presented a very accessible programme of bassoon concerti by Vivaldi, Du Puy, Villa Lobos and Olthuis, receiving rave reviews including this remark in Luister, a Dutch music magazine: “Judging by his playing, Mr van Sambeek awaits a golden future”. In March 2012 Brilliant Classics released his second CD “Bassoon-Kaleidoscope” full of different chamber music, including a rock song, and in the coming seasons he will perform the new bassoon concertos by Sebastian Fagerlund and Kalevi Aho and record them for the BIS label.